There really is only so much power that you can create with your bare feet while bodyboarding. Adding the best bodyboard fin to your gear set can truly get you to the next level. A pair of fins will add to the power that you have while propelling you through the water with more ease. In comparison to other fins, bodyboarding fins are on the relatively lower end of price range, especially when you consider their price to value ratio. A good bodyboarding fin can offer you something that is unattainable with just barefoot bodyboarding. With it being a fun sport for adults and children alike, you’ll always want to stay out on the water just a little bit longer. With these fins, you’ll be able to do that with much more ease as well as go to the levels that you could not before. Do not forget to check out our other reviews for great bodyboarding products such as the best bodyboards. Water Socks are great if your fins are feeling too big or if you want to protect your feet more, then check out best choices here. There are quite a few models and brands on the market currently all of who offer ‘great’ bodyboarding fins. But how many of those are actually high-quality products. We’ll be going through the five best bodyboarding fins in our opinion as well as sharing a buying guide that might make your research a little easier. We know that it can’t be easy to know what you need to look out for in a great bodyboard, so we’ve done the research so you won’t have to. All you need to do is simply purchase a pair and add so much more power to your kick while bodyboarding. So, continue reading to see our five best bodyboard fins currently on the market today. These fins by Churchill are designed and used by professionals around the world. So, you know that you’ll get quality equipment from a company that produces gear for pros around the world. They are sure to offer you with comfort and power while you’re underwater. These are designed with a stiffer rubber to give you more thrust, which will allow you to take advantage of waves small and big. They are made with a stiffened inner rail that offers you with more control. The materials and design used ensures that these fins can be worn in all types of conditions. This pair of fins features adjustable straps and an open heel design. It comes in three sizes, which are extra-small to extra extra-small, small to medium, and large to extra-large. They are easy to put on with the convenient thumb loops. Though they are quite lightweight, they are also very sturdy. The fin blade is flexible enough to propel you forward. Their length allows you to walk from the shore to the water without experiencing much difficulty. The fins also come with a mesh bag and shoe ‘trees’, which hold the shape together when it’s not being used. These are great to be worn either barefoot or with socks, depending on the temperature of the water that you’ll be snorkeling in. Hydro TECH fins are one of the best fins for bodyboarding. They have a multitude of unique features built directly into the fins. So much so that they actually won an Australian design award. They have a patented V rail design that offers you more distance while your underwater as well as providing you with more thrust. Each foot is molded to offer the most natural movement possible. Instead of using rubber, Hydro TECH utilizes T-Form that makes them extremely comfortable. There are also drain holes that stop any water from building up inside and weighing your feet down. Overall, it ensures that there is less effort required for you to speed up. This fin by U.S. Divers provides you with a functional and stylish design that enhances the overall value and appeal of the product. It is designed to offer users with speed, power, and acceleration while working to conserve your energy. The fin really stands out from the rest due to its dual composite blade design that helps to cup and channel water more efficiently. Thus, being the ideal fin for body surfing and bodyboarding. It also features a built-in leash system, soft foot pocket, and an adjustable foot strap. It only comes in one color, which is red and black, but they do offer three sizes, which are small (4 – 7), medium (7 – 10), and large (10 – 13). It is engineered to provide you with great speed and power while still conserving your energy. The compact length makes it great for travel snorkeling, body surfing, and body boarding. We found that the side clip unclipped by itself quite often. As a top brand in the swimming gear industry, Aqua Sphere is known to produce high-quality products, with this being no different. They are quite affordable in comparison to some other brands, but they do only have one color choice available. They come in a fairly large range of sizes, ranging from size 13–1 (32 – 33 EU) to size 11–12 (46 – 47 EU). It features a short blade and an optimal amount of stiffness that help to provide consistent tempo and kick flow. The shortfin design is also great for achieving powerful, fast, and short kicks during training. They are made from 100% natural rubber, with raised rubber ribs that allow the proper channel of water. The edges are rounded well, which helps to avoid any scratches if you accidentally get kicked by them. You might be wondering why you need bodyboarding fins. There are, in fact, several reasons as to why you might benefit them, but we’ll outline the top five for you. When you’re just bodyboarding barefoot, you’re susceptible to the speed of the waves. With bodyboarding fins, you can propel through water very fast and the fins let you control how fast you want to go. The extra push from the fins allows you to catch more waves than were possible if you went barefoot. It can feel daunting if you imagine thundering down a pipe while you like are lying on top of a board. It might be difficult to stay in complete control, but with these fins, you’ll be able to decide when and where to turn. The little waves are fun and all, but there’ll come a time that you want to experience bigger waves. You won’t be able to do that without swim fins on your feet. With the fins, you’ll be able to stay in control while you ride the waves and accelerate when you need to, not just when the waves deem. Whether you’re riding small waves or large waves, you might not always be 100% safe. There will be experiences where you just land hard, perhaps there might even be a time that you land on your face. It’ll be a safer experience if you’re wearing your fins while bodyboarding because they’ll allow you to reach the surface a lot faster. If you get hurt, then you’ll still be able to reach the shore faster. At the end of the day, we’re all looking to have fun while we bodyboard. Bodyboarding barefoot might hold your interest for a while, but you’ll be wanting bigger and better things soon. These fins are great to help you achieve more challenging adventures. When you’ve decided that you want to purchase a bodyboarding fin, then you’ll need to go through several criteria to figure out which one is your perfect fit. This includes materials, floating, foot shape, comfort, size, fit, price, function, and style. This is one of the biggest factors that will need to be considered. You’ll want to ensure that it’ll be made from 100% natural gum rubber to get the best quality fin. It can be a great thing to have floating fins. They will be great in situations where they fall off your feet and instead of sinking to the bottom, the float on the surface. 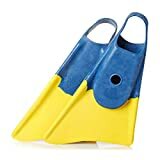 There are some people that have differently shaped feet, so that’ll need to be considered when looking at potential fins to purchase. There are some brands that make narrower foot pockets while some either have normal or wider foot pockets. Unless you have narrow or wide feet, you should be fine with any fin. Comfort has to be one of the biggest factors as who wants to be uncomfortable while underwater. You’ll want to find a fin that is well-balanced in stylishness, affordability, strength, blade length, and most importantly comfort. The most comfortable fins will be ones that have softer rubbers and blade that are more forgiving. Different companies have different size charts, so you’ll have to ensure that your feet size can be accommodated in one of the sizes that they offer. The comment or review section is also a great place to look for sizing advice as you’ll often find other reviewers mentioning if they run small, run large, or are true to size. Fins normally come in two different shapes, which are asymmetric designs and symmetrical designs. The final choice for you will really have to be a personal preference of what you like and what fits you best. The fit of your fin should be comfortable but also snug. There should not be too much slack or wiggle room as that’ll increase the changing of them falling off. However, they should also not be too light that they are hard to get on and off or ones that bend your toes. The perfect one should feel snug, offer enough room for your toes to not feel cramped and not have excessive wiggle room. They should also be firm on the heel. It might also be a good idea to purchase tethers or fin savers, which just tie on the fin’s heel strap and attach to your ankle. It’s a good piece of equipment to have to stop your fins from being swept off by the waves. Fancy trying your hand at other surfing sports that doesn’t need you to be near the sea? You should look into wakesurfing! We have just reviewed the best wakesurf boards on the market. For a great laugh take a look at these towable tubes for adults.